So a few days ago I got new memory for a development box – an upgrade from 4 to 6 GiB (later on even 8 GiB). Much appreciated as you can imagine. After dismissing the BIOS warning about changed amount of memory (oh really? :mrgreen:), I booted into Ubuntu and happily looked at the memory stats. After that I booted into Windows (a Windows 2003 Server Standard, but I’ll just use Windows from here on) and was disappointed to see only 4 GiB available. This is apparently a limitation specific to the Standard edition. After some pouting, I decided to take action. Of course one of my first thoughts was to ask Remko, because he had done similar things for some other Windows versions. He pointed me to MmInitSystem, which was not an immediate hit, though. I loaded my kernel .exe into a disassembler to look at the details, but MmInitSystem was a lengthy and rather boring function. However, the advice was good and got me a good bit closer, especially when Remko also mentioned the use of ExVerifySuite in the logic that would set the limits. So I brought up the references to ExVerifySuite and – surprise surprise – only seven other functions used it and out of these only one was not recognized by name from the exports and debug symbols. And since the inspection of that function (at 0x00615FB0 in my kernel) proved that it was being called from MmInitSystem, this was an immediate hit. 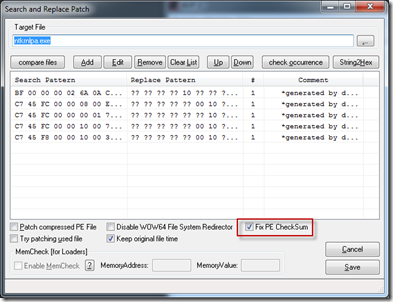 A missing feature in the dUP2 Patch Generator has always been to correct the PE Checksum. After all if you write a clever search&replace patch but have to include the PE Checksum it doesn’t make any sense. 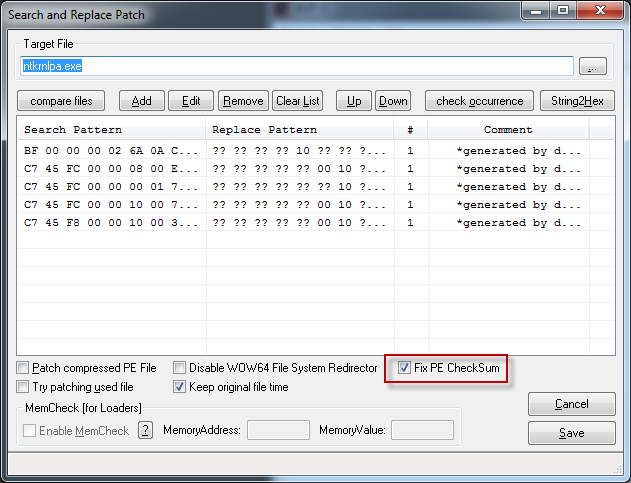 But then I saw there’s a beta version of dUP2 that supports ome new features one of them being a fix checksum option! First we need to setup a Linux Virtual Machine with a distro of choice (I recommend a 32 bit version). I will be using Ubuntu here and the first step is to download the iso. 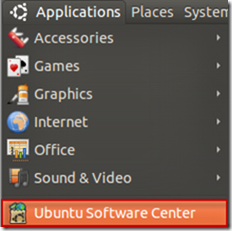 At the time of writing Ubuntu 10.10 was the Latest version so I used that one. The install is unattended (when VMWare Tools are installed you need to perform a login) and took only 6 minutes on my laptop! 0x0000005D means UNSUPPORTED_PROCESSOR (defined in bugcodes.h) so I expected there was a x86 vs x64 problem. But instead of the x86 version of Windows PE, Altiris attempts to boot the x64 version and this explains the BSOD: VMWare prevents the CPU from going to x64 mode and thus Windows has no choice but to halt. Note that it’s no problem to deploy an x64 OS using the x86 version of Windows PE so I don’t see any real problems with this workaround. If you read one of VMWare’s Best Practices Guides (in my case this one) then you may have read that it’s important to align guest partitions. We can do this (for Windows OS) using the DiskPart tool that comes with the OS since Windows 2003 SP1 (there is a hotfix for earlier versions). On Windows 2008, and higher, all partitions are automatically aligned to a 1 MB boundary. 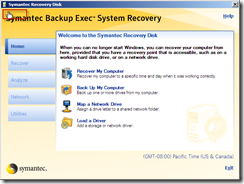 But how to do this for the OS disk on Server 2003? My first thought was to open a command prompt during setup, right before creating the partitions and then use diskpart. However the OS partition is created during the Text portion of the install process and even though we can get a cmd prompt using SHIFT-F10 we get the recovery console (which has a builtin diskpart but cannot align). So I used a Windows PE bootdisk. 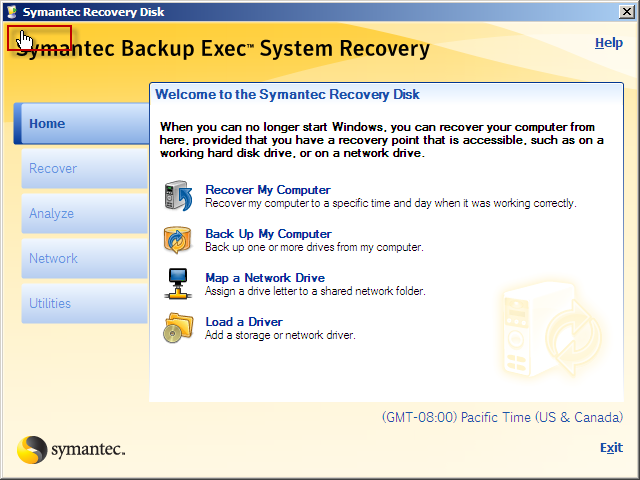 Any version with Diskpart should do but I used a bootdisk from Symantec Backup Exec System Recovery that I’ve customized to my own needs. 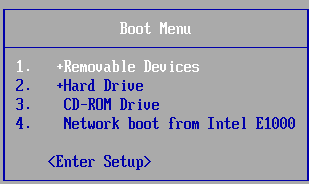 I wanted to boot a Virtual Machine from an USB Stick but even though you can Connect USB devices to VMWare you cannot boot from it. 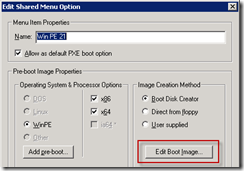 It can be done however using a boot manager that is able to perform a boot from USB media. I used Plop Boot Manager. 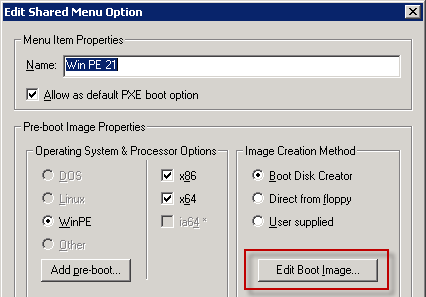 Download one of the stable releases (I used 5.0.11-2) and extract plpbt.img from the archive and mount this (don’t forget to select the Connect at power on option) and when booting press Esc for the Boot Menu. As you may know, recent Intel processors have an extension to the x86 instruction set called Advanced Encryption Standard Instruction Set (AES-NI). AES-NI is basically hardware support for AES based encryption and because I had a chance to run some benchmarks on differing systems I was curious what the impact of AES-NI would be. 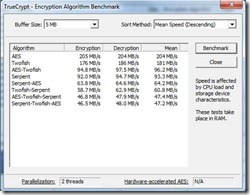 I used TrueCrypt for running the benchmarks because this is a real life application and it had support for AES-NI. The next system was an Intel Core i7 Q740 (Quad Core with Hyperthreading, so 8 in total) machine.